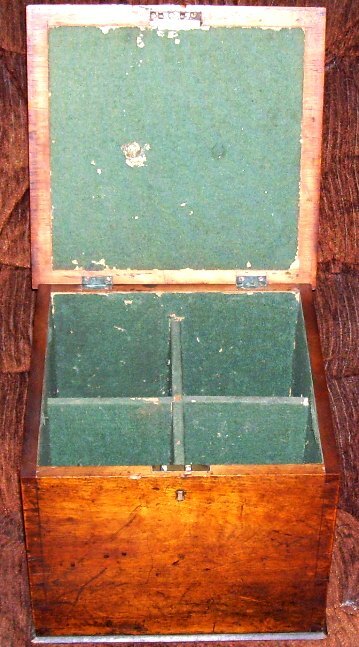 After covering about 3/4 of the shop and my body shuddering at all the Chinese/ Japanese porcelain I saw a large wooden box, not a casket, but a nicely finished relatively square oak box. I asked the lady shop keeper for “any better price?” She said she would have to call the owner, who happened to be in town. He did give me a small discount, to which I said to the lady; “I’ll have to think about it”, which is usually a “kiss of death” phrase within the antique world. Episcopacy was reintroduced to Scotland after the Restoration, the cause of considerable discontent, especially in the south-west of the country, where the Presbyterian tradition was strongest. The modern situation largely dates from 1690, when after the Glorious Revolution the majority of Scottish bishops were non-jurors, and in response Presbyterian government was guaranteed by law. However, controversy still surrounded the relationship between the Church of Scotland’s independence and the civil law of Scotland. The interference of civil courts with Church decisions, particularly over the right to appoint ministers, led to a number of groups seceding. This began with the secession of 1733 and culminating in the “Disruption of 1843”, when a large portion of the Church broke away to form the “Free Church of Scotland” The seceding groups tended to divide and reunite among themselves — leading to a proliferation of Presbyterian denominations in Scotland. 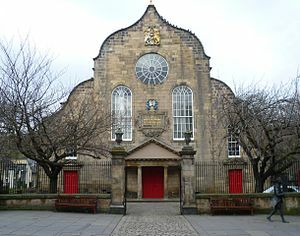 Following the Disruption of 1843, a Holyrood “Free Church” congregation was formed in “Canongate.” By 1845 a church was built in front of the Palace of Holyroodhous. The Canongate was a separate burgh before it was formally absorbed by Edinburgh in 1856. By the late 1970s, the lower part of the Royal Mile, including the Canongate, had become unfashionable and run down. The local population was declining. The Kirk was threatened with closure, which was successfully resisted by the minister and congregation. Since then, circumstances have changed radically – notably with the construction of new flats in the vicinity as well as the new Scottish Parliament building. This is a photo of two of the four bell-metal bronze chalices, all right at nine inches tall. It shows how individually each was made by the master’s hand. Look at the position of the knop on the stem, and the slight difference in total size. The building programme produced 470 new churches within a year and over 700 by 1847. Manses and over 700 schools soon followed. This programme was made possible by extraordinary financial generosity, which came from the Evangelical awakening and the wealth of the emerging middle class. The church created a Sustentation Fund, the brainchild of Thomas Chalmers, to which congregations contributed according to their means, and from which all ministers received an ‘equal dividend’. This fund provided a modest income for 583 ministers in 1843/4, and by 1900 was able to provide an income for nearly 1200. This sharing and centralizing of resources was previously unknown within the Protestant churches in Scotland, but later became the norm. In the following years the “Free Church” Assembly showed increasing willingness for union on these open terms. However, the ‘establishment’ minority prevented a successful conclusion during the years between 1867-73. After negotiations failed in 1873, the two churches agreed a ‘Mutual Eligibility Act’ enabling a congregation of one denomination to call a minister from the other. During this period ‘antidisestablishmentarianism’ party continued to shrink and became increasingly alienated. This decline was hastened when some congregations left to form the “Free Presbyterian Church” in 1893. Starting in 1895, union began to be officially discussed once more. A joint committee made up of men from both denominations noted remarkable agreement on doctrinal standards, rules and methods. After a few concessions from both sides, a common constitution was agreed. However, the ever-decreasing minority in the” Free Church” Assembly protested, and threatened to test its legality in the courts. The respective assemblies of the churches met for the last time on October 30, 1900. On the following day the union was completed, and the “United Free Church of Scotland” came into being. Cont. from above) I walked back up the steps and out onto one of the courtyards of Colonial Williamburg. Across the square was a shop selling brand new pewter items, mostly all reproductions of items found at the original C / W site. I decided to go inside and take a look. One of the first things I noticed was a slightly smaller sized pewter chalice, in just about the same design of those I had just left behind. A single piece’s price was only an amazing 15 dollars “less” than any one of those dated “1845” chalices (individual cost with the total divided by 4.) AND EACH OF THESE WERE ABOUT 145 YEARS OLDER! The striker (stick) is to tap on each when I am showing the collection off. The vessels being made of bell metal bronze, each has a distinctive ring tone to it and using the striker makes them a lot louder than one’s finger does. 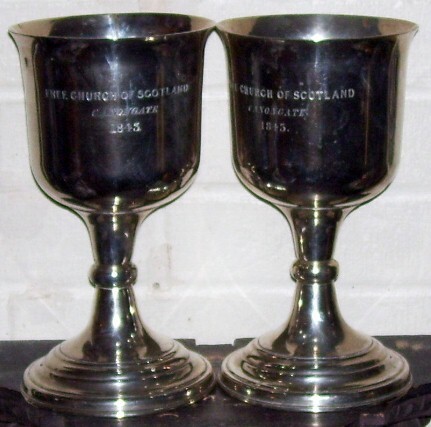 Subsequently I found out all of the above history, and now know that as part of the newly built “Free Church” Kirk’s possessions (and also to recognize the new church’s title) these four chalices were procured. 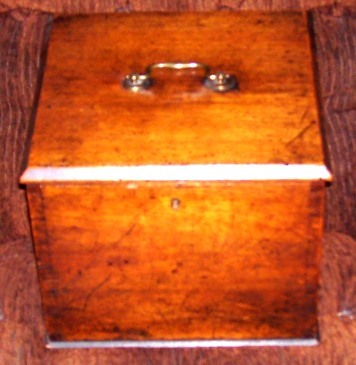 I am assuming, as there is not dedication on a placard on the oak carrying case, that these were four vessels were ordered by the elders and were not a gift from one person. These dedications are often seen engraved on lots of “early” church vessels, both in Europe and America. When I have over some very special wine drinking guests, such as my step-son and step-daughter, these come out to the table FOR USE! 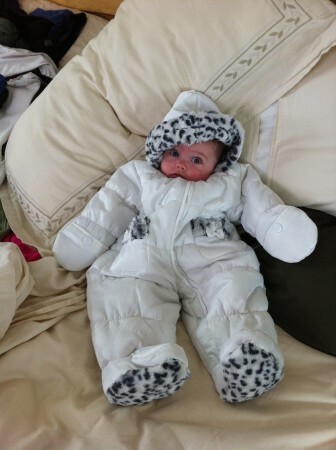 Here’s their 6 month old baby in her first “snow suit” -She’s been a billborad child for the hospital that delivered her as a preemie, in Denver, CO.